The five reports listed above provide more than enough data to navigate toward most destinations. However, there are times when you want deeper insights around your page. 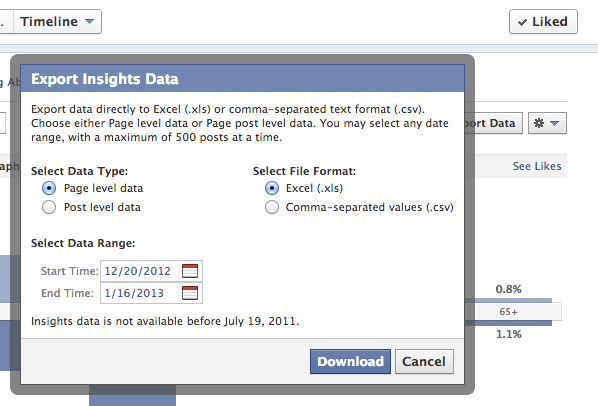 That’s why Facebook allows you to do a full data dump (up to an 89-day range) of all your Insights data. Data on post impressions. Impressions are the number of times a post is displayed, while reach is the number of people who saw those posts. You can export either page level or post level data from your Page Insights simply by clicking the Export button on the top-right corner of any of your Insights tabs, and selecting page level or post level data, the date range you want to analyze and the format for your export (as shown above). Insights data is not available before July 19, 2011.John Haydon delivers social web strategy solutions for “the quick, the smart, and the slightly manic.” Curious? Then connect up: Contact John by email, see his profile page, visit the John Haydon blog, follow him on Twitter and Google Plus or leave a comment.